The "Pleasant Revolution" musical bike collective is coming to Vancouver as part of their West Coast concert tour powered by bicycles. They'll be at the Vancouver Art Gallery (720 Hornby Street) 3-7 PM Saturday, July 2. It's a free event & after the show, everyone is invited for a ride to the beach for a sunset with Pleasant Revolution. 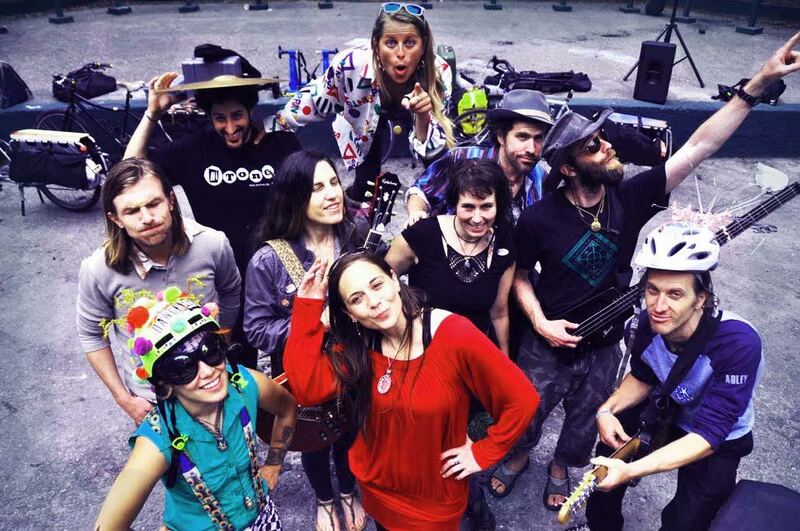 This summer, a group of musicians, artists and cyclists known as the Pleasant Revolution will embark on a tour through the Pacific Northwest, with a mission to produce exhilarating and inspiring concerts completely off­ the ­grid. Why is this important? As global warming effects more and more communities across the planet with droughts, melting glaciers, and other drastic ecological shifts, there is a need for educational empowerment and a growing demand for cooperative self-­sufficiency that this tour aspires to address. The events on this tour are called Biketopia Music Festivals; all of the sound amplification is powered by stationary bicycles. The Pleasant Revolution collective works with local musicians, bike enthusiasts and environmental groups to co-­create these grassroots, community empowered festivals. The Pleasant Revolution is currently scheduled to land in Vancouver, Salt Spring Island, Victoria, Seattle, Bellingham, Olympia, Astoria, Portland, Eureka, Arcata, Santa Rosa, Petaluma and a grand Bay Area return. They will also be putting on impromptu concerts in unexpected locations along the way. The music on the tour will be performed by Latin circus funk band Bicicletas por la paz (Bicycles for Peace), neo­folk­soul artist Heather Normandale and various other artists both on the tour and from the towns they will be visiting. The mission of the Pleasant Revolution is to inspire cooperative community effort through music and through the collective effort of the audience producing the show’s electricity on bikes! This tour will be hauling all of their gear on bike, no “sag wagon” required. The impact of this project is not just about showcasing good music and sustainable technology; it is to inspire and empower creative minds to think outside the box and realize the power that exists in community. The Pleasant Revolution has recently launched a crowdfunding campaign on Indiegogo to help raise funds needed to launch this traveling musical and theatrical extravaganza. The funds raised will helped pay for the pedal­-powered sound system, cargo­bikes, crew food and maintenance. The Pleasant Revolution is a concept invented by Kipchoge Spencer who first took his band, Ginger Ninjas on bike tour in 2005, and has since toured through the states, Europe, and Mexico over the past 10 years putting on self­-produced bicycle music festivals. This year, two bands who both have a history participating in musical bike tours will pick up the torch and continue the project’s mission. Seems like you had a great music time! The best part of revolution was the collective of musicians.